Ali B is an English disc jockey, radio presenter and producer. He is a former resident DJ at Fabric in London and is the owner of Air Recordings. He has released numerous singles and extended plays. He has also worked in radio for over a decade, hosting regular shows for Capital FM, Kiss FM and BBC 6. Ali B began his career at the age of 18 at the Blue Note Club in London. He then moved on to Fabric where he had a ten-year residency. He was one of the first DJs to play at Fabric and also performed at their pre-opening party. 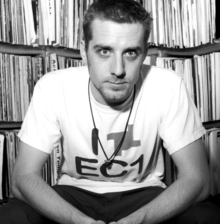 In 2002, Ali B recorded FabricLive.02 as part of the Fabric Live Series. Ali B also worked at Acid Jazz Records before moving on to handle PR for British DJ Norman Jay and Pete Tong of BBC Radio 1. He has performed at numerous notable events such as the 50th birthday party of Mick Hucknall and the anniversary party for Gary Barlow and his wife. He also performed on the set of Friends during a filming of the show in London as well with Mark Ronson at Abbey Road Studios. He is also one of the early champions of AfrikaBurn as well as regularly appearing at Burning Man.